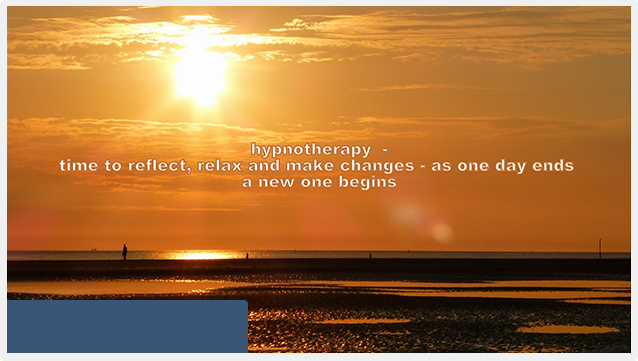 Hypnotherapy is a relaxed state of body and mind, which allows the therapist to help you find alternatives to the present way of feeling or behaving. The aim of this approach is to assist you to change unwanted habits and undesirable behaviours. Therapy also tends to help you become more confident, more accepting and therefore can help you reach your potential goals. Beneficial change is often seen within a relatively short time and therefore is generally a short term approach for many issues such as phobias, smoking cessation, exam fear, and interview stresses. It is often combined with counselling for issues such as self harm, stress, anxiety. For IBS clients are required to commit to the full protocol and details are listed in the appropriate area of the site. Remember stress for the body is physical as well as emotional so being busy, in a high powered environment, having poor sleeping habits, missing meals, over exercising all cause the same reaction - the sympathetic nervous system increases the adrenaline to help the body. If you stay in the same ‘busy mode’ it doesn’t switch off and this raises metabolic rate, increases heart rate and among other things, increases blood sugar and intestinal motility. It can lead to headaches, anxiety and sleep disturbance. Break the cycle – use deep relaxation as a starting point.